In many environments, contamination poses a serious risk. Hospitals, schools, and food service to name a few. Poor hand washing can cause cross contamination and cause disease. The easier it is to keep hands clean, the better. T&S believes in the importance of hand washing. To meet hygienic needs, we have developed a range of high performing electronic faucets. By installing an electronic faucet, you’ve just removed one significant factor in contamination. In school for instance, that sick teacher that should be at home, doesn’t need to touch the faucet to turn it on. So the next 20 kids who use the faucet that day, won’t get what she had. 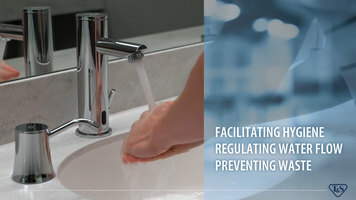 In the food service environment, there is no longer a risk of touching a food product that may harbor food born disease, turning on a faucet to wash your hands and coming into contact with the food product again and you shut off the facet and move to another task. With T&S electronic faucets, you never need to touch the faucet and the impurities you bring to the sink won’t come back to haunt you after you have finished washing. In fact in these environment and many more, there is not a more useful tool than an electronic faucet. They are so easy to use that they actually encourage more hand washing as well. Avoiding contamination is a huge benefit, but electronic faucets also offer dramatic water savings since they only flow when hands set off their censor. They are easier to maintain with fewer moving parts and potential leak points. There are even a range of options for how the electronics in the faucets are powered and two different lines of faucets, checkpoint and our value line equip. T&S is the only provider of electronic faucets that also offers a mixing valve as standard. And our single skew makes it easier for specifiers, dealers, and contractors. Ease of installation is just one of the many benefits of T&S electronic faucets. Place the faucet on the sink, align it with the mounting holes, and tighten the hardware underneath the deck. Tighten the center nut with a ¾ inch socket. Attach the flex water lines to the shut off valves and tighten them securely. Then fasten the control module to the wall using the specified locations located on the module. Attach the mixing value onto the inlet of the control module and tighten it, in most cases this is already pre-installed. Secure the mixing valve to the lines using the half inch of the hose and tighten them securely. Next attach the flex line to the faucet inlet and to the control module outlet. Be careful while tightening, not to damage the electrical connection to the sensor cable. Align the arrow to the center cable to the module and then connect them to each other. Finally screw the sensor cable’s connector cover onto the control module. Turn on the water and check for leaks. Now you are ready to set the electronic eye of the faucet. Access the module and press and hold the on and off button for 5-7 seconds. The water fluid should start then stop. Release the button, you will notice that the LED light will blink on then turn itself off. You will want to set the range somewhere between the faucet itself and where the water will flow. Place a flat object like a card or your hand at the desired distance from the sensor. The LED will turn itself back on. Press the on/off button on the module before moving the object away and the light will flash 5 times to let you know that you have saved the range setting. You can reset the range at any time during the life of the faucet. T&S gives you alternatives for powering your electronic faucets. Most installers choose to use batteries, even though this puts the faucet at risk of running out of power and becoming unusable for a time. It’s almost as easy to use the AC adapter, which brings the added advantage of using the batteries as backup in case of a power failure, with a need to replace batteries only every few years. There is a third option that takes your electronic faucet to the next level while saving you maintenance time and money. That option is the hydra generator. The hydra generator is a T&S innovation that powers your electronic faucet with the flow of water itself. As water passes through the lines of your electronic faucet, it fuels your hydra generator like a high tech water wheel, allowing it to gather and store energy that it can use to power the electronic sensor and water flow. The hydra generator can also act as a primary source with the batteries as a backup, for those interested in sustainability and water conservation; there is no other option like it anywhere. Installing the hydra generator is simple, as easy as installing one more part between the mixing value and the control module. T&S electronic faucets are also available with other options to ensure they fit their environment perfectly: The LN (less nozzle) option, the SM (side mount), SMT (side mount option w/thermostatic valve), TMV (below deck option with thermostatic mixing valve), LF22 featuring 2.2 gallons per minute with a vandal resistant laminent flow. Choose a faucet with T&S and enjoy the benefits of water savings, lower installation and maintenance costs and dramatically reduced contamination. Watch this video to learn how easy it is to properly install and configure a hands free electronic faucet from T&S Brass! I help you save water. I help make cleaning more efficient. I help keep your kitchen running. I help provide reliability you can trust. At T&S, we provide commercial plumbing equipment for hundreds of applications. It all started inside a small New York garage back in 1947. Today, we're a global brand serving markets around the world. Our customers know us as a family-owned and operated company, and we still go by the same trusted name. T&S Brass and Bronze Works. For more than 60 years, the story of T&S has been one of growth, expansion, and innovation. After inventing the market's first pre-rinse unit in 1947, T&S quickly established itself as the industry's premier manufacture of foodservice plumbing products. Over the next 2 decades, our company expanded into new commercial plumbing markets, leading founder George Tyson to purchase property in South Carolina to accommodate a new, 80,000 sq. ft. plant. As growth continued, T&S opened facilities around the globe, including another manufacturing facility in Sheung Hei, China, helping to shape the company into the truly international brand it is today. Our track record of innovations speaks for itself, but our reputation for service is what sets us apart. With more than 10,000 interchangeable parts and the ability to quickly handle custom modifications in house, the experts of T&S are proud to deliver real solutions to customers every day. At T&S, taking care of customers at every step is our number one priority. Maybe that means getting orders out the door fast with our 24 hour quick ship, or assisting with design and engineering. And with our state-of-the-art contact center, we work directly with each customer to find the right solution. It's what we're all about. Many customers know T&S for a few must-have products, but we actually manufacturer thousands of plumbing solutions for every corner of today's commercial, industrial, and institutional facilities. Clean your dishes, fill your pots, wash your hands, prep for surgery, prevent the spread of germs, get a high-power clean, connect with confidence, stay safe. Our customers are often surprised to learn the real depth of all we offer. The truth is, we've been serving every major market with an extensive product offering for years. When you look around, you'll find T&S is hard at work in more places than you might think. Restaurant, grocery, healthcare, hospitality, schools and education, convenience stores, pet care, prisons, commercial buildings, stadiums, cruise ships. At T&S, we know it takes more than an impressive product line to be an industry leader. It's about the total package, the right solutions, superior service, and doing business the right way. That's why we focus on quality at every turn. Our in-house testing actually exceeds national standards. We have 5 distinct inspection operations within our production process so each product is rigorously tested to ensure it's built to last. And, just as quality is a constant focus for our team, sustainability has become a leading consideration for customers, but that's hardly new to us. Whether it's pioneering low-flow faucets and fittings before they were widely used, implementing green operational practices, or making products made to last a lifetime, T&S has always been a leader in water and energy conversation, as well as responsible manufacturing. It has always been important to us, even if we didn't call it sustainability back then, all over our company, in all of our facilities, and in all of the products we offer, we build in the kind of efficiency today's market expects and demands. We've been offering sustainable solutions all along. With more than 60 years of experience under our belt, and a family-owned approach that continues to this day, our partnership with customers continues to be the foundation of the T&S experience. We grow, we innovate, we raise the bar, we listen, we provide the best solutions. That's what it means to work with T&S today and always. Learn how T&S Brass works to provide you with high-quality products and superior service! With over 60 years of experience, they have the plumbing solutions you need for your business. When a faucet or pre-rinse unit begins leaking, it immediately goes from a wonderful, convenient apparatus to a headache. Because it often seems difficult to diagnose, leaky plumbing can go for months or even years without being repaired. Meanwhile, water bills can silently rise and rise. 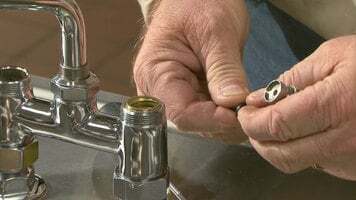 The reality is, that many end users, and even some plumbers, don't know the true cost of a leaky faucet. According to the EPA, a faucet that leaks at the rate of 1 drip per second can add an extra 3,000 gallons per year to a water bill. 3,000 gallons, that's enough to fill 3 firetrucks. The good news? Leaks are actually simple to diagnose and just as manageable to fix. The first thing to understand is why leaks occur. It's not usually because the metal itself has developed a hole or perforation. Usually, the problem is much simpler than that. Leaks almost always occur due to wear and tear on soft warn parts, such as a gasket, washer, packing, or O-ring. These parts allow the faucet or pre-rinse unit to function smoothly, and in order to do that, they have to compress or give a little each time the unit is used. Let's take a look at the most common leaks and what you can do to repair them. On a faucet, you may notice a leak on the spout itself. The solution here, you may need to replace a seal between the outlet tip and nozzle. Or, the leak may be back at the cartridge spindle itself, where a worn seat washer is letting water into the spout. Is there a leak around a faucet handle? You'll need to replace the worn packing inside by removing the bonnet nut and replacing the old packing with new packing. Leaking at the base of the bonnet means the top gasket is worn and needs to be replaced. Leaking at the nozzle base while the water is running tells you that the swivel o-ring has worn and your faucet is ready for a new o-ring. Leaks at the coupling flange are due to an old gasket. Replacing that will solve your problem. On a pre-rinse unit, leaks may be even more obvious. A leaking hose is one that is punctured or perforated and needs to be replaced. A leak around the spray face means you need a new rubber bumper. A leak through the spray face itself means its time to replace the bonnet assembly. But, the other common leaks are nearly identical to those on a faucet. If there is a leak at the base of the handle, you'll need to replace the washer inside the handle to stop the leak. A leak at the top of the handle means a hose washer that needs replacing. Leaks around the pre-rinse faucet or riser itself will inevitably be identical to the faucet leaks described previously. Leaky plumbing, no one likes it. But it's not difficult to investigate and repair. T&S makes it easy to keep your faucets and pre-rinse units performing at their best. Leaky plumbing doesn't have to be a major time sink - in fact, it's pretty easy to diagnose! Watch this video for more information on how to troubleshoot leaks around your faucets and pre-rinse units. T&S offers truly sustainable plumbing solutions. The need for water conservation is a growing concern, as water is a precious resource. Businesses use a great deal of water, as shown here in this chart. The restaurant industry, educational facilities, hotels, hospitals, offices, and supermarkets all consume vast amounts of water. To cite numbers, restaurants use 7,736 gallons per day; educational facilities use 37,761 gallons per day; hotels use 5,531 gallons per day; hospitals use 47,250 gallons per day, offices use 27,675 gallons per day; and supermarkets use 7,703 gallons per day. That's a lot of water! Even so, these businesses are doing their part to conserve, and T&S has a way to help. It offers products for plumbing that are LEED certified and great for new constructions and renovations. Plumbing fixture fittings can even contribute to up to 4 LEED categories, including water efficiency, materials & resources, innovation, and regional priority. For the most point-earning power, choose low-flow products from a responsible manufacturer. T&S creates sustainable solutions with beneficial alliances and responsible manufacturing, where all corrugation, plastic shrink wrap, trays, and office paper are recycled and where 100% of the polishing dust is collected and re-purposed. Nearly 9,000 gallons of coolant is even recycled annually. Plus, 6% less electricity is consumed through new lighting, heating, and cooling efforts. Smart low-flow products include spray valves, aerators, sensor faucets, metering faucets, and ceramic faucets. 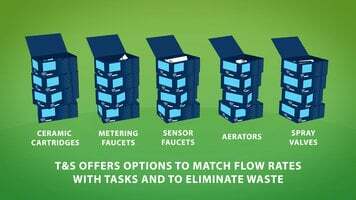 T&S offers options to match flow rates with tasks and to eliminate waste. Saving water helps the planet and saves money. The cost of water, the cost of energy to heat the water, and the cost of sewage to dispose of the water is expensive. Small changes can add up. Reliable T&S products last for years, and fewer product replacements mean less waste. With T&S, you can enjoy a lower total lifecycle cost and more money in your pocket. Through easy water conservation efforts, you can save money in total operating costs, resulting in more money to invest in your business. From ceramic cartridges to aerators and spray valves, T&S offers a range of products engineered to help conserve water, save money, and promote overall efficiency. Nearly 70% of the earth's surface is covered by water. That's almost one billion cubic miles of water. However, the mast majority of that water is salt water, which is virtually unusable for human consumption. Only 3% of the earth's surface contains fresh water, and only 25% of that fresh water is available, since the rest is locked away in ice caps and glaciers. 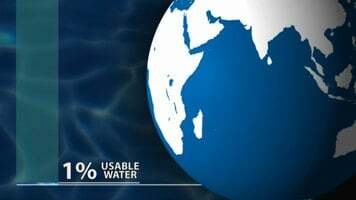 In fact, only abut 1% of the world's fresh water is easily accessible and usable for drinking or washing. As you can tell, there's not a lot of water to go around. The reality is that usable water is a limited resource. As the world's population grows, and even as some cultures gain access to fresh water for the first time, there will be even less to go around. Before you start worrying, this trend doesn't mean that there's not enough water for the world's population. It does mean that the more we can develop water-conserving products and processes, the better. At T&S, we've always taken water conservation seriously. In 1947, we introduced the first pre-rinse unit to the foodservice industry, and within 4 decades, we had innovated it into the first low-flow unit designed to save water and energy. Today, our B-0107-C and B-01078-C pre-rinse units are both endorsed by the Green Restaurant Association. The savings don't stop with just pre-rinse units, either. T&S offers thousands of products engineered to save water for both the plumbing and foodservice industries. Here are a few of our favorites. Consider our electronic faucets. Their water runs only when the faucet sensors a user's hands under the spout, and since the flow is set at a predetermined rate, it's impossible not to save water. Compared to a standard faucet, an electronic faucet from T&S can save as much as a gallon of water per handwash. Our B-107-C spray valve, the first low-flow unit of its kind, operates at a low 0.65 gallons per minute. That means even EPACT compliant spray valves use almost 250% as much water as the B-0107-C. In this dramatic demonstration, you can see how much water is saved in just a few seconds by our new low-flow spray valves. Our 0.65 gallon model is on the left. A standard 1.42 gallons per minute model is on the right. You can see our new low-flow spray valves, in just 15 seconds, use far less than 1/2 the water of the current federal standard. In many settings, metering faucets can provide just the right level of performance, while also conserving water and energy. Since they operate with the push of a button, metering faucets don't even require the minimal energy that electronic faucets do. Yet, they continue to regulate both the duration of flow and the amount of water for the user, turning on when the user desires, and stopping the flow at a predetermined time. For many faucet applications, electronic and metering simply aren't an option. For those applications, T&S offers a range of low-flow aerators. Keeping the water flow to a minimum while ensuring performance, our aerators can save you water and energy in even high-use settings. Again, watch this brief comparison between a standard faucet on the right and a T&S low-flow aerator on the left. In just 15 seconds time, you can easily see the dramatic difference in the amount of water consumed. For those who are interested in LEED certification, many T&S products can help contribute to 2 of the 6 performance categories for energy-efficient buildings: water efficiency and materials and resources. No matter your need, no matter your application, T&S has the perfect options to help you conserve water and energy. With water becoming a scarcer commodity, you can't afford not to consider T&S efficiency. Water is becoming a more and more limited commodity around the world, making water conservation more important than ever. With T&S faucets and aerators, you can easily reduce water consumption, thereby minimizing overall operation costs. This video explains how T&S can help you save. Replacing faucets with T&S wall adapters. With T&S wall adapters, we make it easy to replace competitor's faucets like Fisher, Chicago, and Zern, with a T&S faucet. These customized couplings give you a perfect fit with your existing hardware and a simple transition to your new T&S faucet. With T&S wall adapters, your plumbing can be sound and top quality without the time of re-plumbing inlet hardware. If you need to replace a faucet made by Chicago or Zern, T&S offers the BO466. Simply remove your existing faucet and its hardware down to the wall mounts. Replace the old seals with the new T&S washers. Then, attach the male end of the adapter to the existing hardware. Be sure to tighten using the hex on the outside of the assembly. 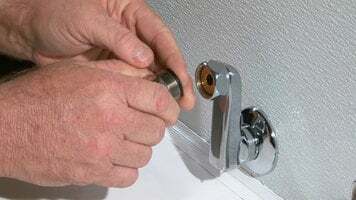 Trying to tighten the connection with a hex key or allen wrench can break the lock tight seal and create a leak. Insert the new washers into the female ends of the adapter and you're ready to attach and tighten the faucet. If you 're adapting from Fisher hardware, we offer the B0467. You'll notice that Fisher wall mount hardware ends in a male fitting, so our adapter features two female ends. We've made it easy for you to tell them apart by scoring the corners on the Fisher end of the coupling. Otherwise, installation is similar. Replace the existing Fisher seals with the new T&S washers. Tighten the coupling, first to the wall mount, and then to the faucet using an adjustable wrench or pliers. With T&S wall mount adapters, it's easier than ever to upgrade from Chicago, Zern, or Fisher to T&S quality. Replacing a competitor's faucet with a T&S one is easier than ever thanks to T&S wall mount adapters! Watch this video for more information. Facilitating hygiene, regulating water flow, preventing waste. When it comes to these critical considerations, sensor faucets provide a truly reliable and convenient solution -- one that's both easy to use and control. And with the complete offering of models designed to fit a wide variety of applications, T&S's Chekpoint line offers the very latest innovations in electronic center faucet technology. So what exactly makes sensor faucets ideal for a variety of applications? The hands-free operation of sensor faucets ensures that the risk of spreading germs is greatly diminished. That means healthier customers and staff and less absenteeism on the job. And when it comes to saving water, sensor faucets are the perfect solution. Preset flow rates and shut-off delays help cut-down on the volume of tempered water used, helping minimize environmental impact and contributing to lead certification. These benefits of sensor faucet technology are particularly relevant to a full range of markets, including inside the healthcare environment, educational facilities, and food service operations. When configuring the ideal solution for a particular facility, it's important to consider the basics first. T&S offers both above deck and below deck sensor faucets. Above deck sensor faucets house their electronics in the faucet body, itself above the sink. The electronics for below deck faucets are housed separately from the faucet, underneath the sink. Our above deck sensor faucets are available in these base models. This design offers a generally cleaner appearance, easier access for maintenance, and an option for point-of-use temperature mixing, or a preset mixing ratio. Below deck sensor faucets are available in these base models. These models offer a more discrete electronic set-up, as well as featuring a preset water mixing ratio. T&S offers a full range of features that come standard with every Chekpoint sensor faucet. First, every model has a variety of adjustable features, including shut-off delay, which sets the number of seconds the water runs before shutting off; sensor range, which allows for customization based on sink size, or personal preference; and automatic time-out, which turns the faucet off for a set period in case of tampering. In addition, the models include a controllable auto flush feature, which flows water after 12 hours of inactivity. Together, these features provide operators with the ability to make adjustments based on unique needs and preferences for every application. 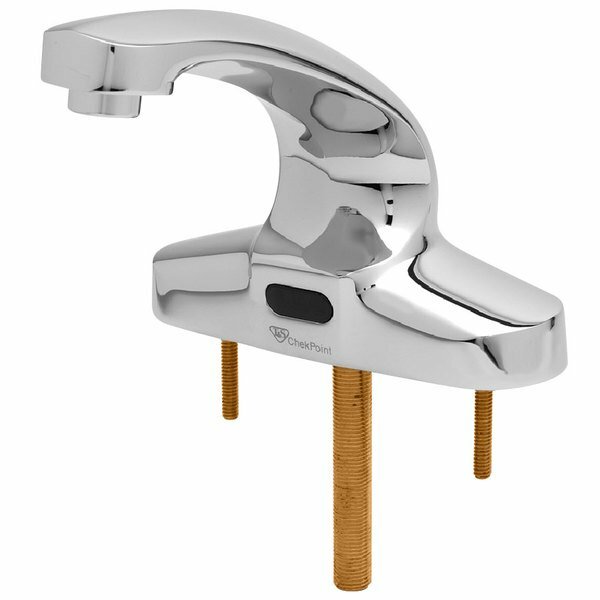 Every T&S sensor faucet also comes pre-assembled with mounting hardware included, making installation quick and simple. You'll also the include even more standard features on every T&S sensor faucet, helping you access critical parts quickly, prevent cross-flow, and guarantee visibility in any facility. T&S sensor faucets are also available with an assortment of options and accessories to further optimize each model for your specific application. While many Chekpoint faucets come with a standard gooseneck design, you can also order without a nozzle, then select from a variety of goosenecks with varying spreads and heights. And when it comes to power, T&S offers a variety of options to fit any application. Our Easywire option connects up to 8 faucets to a single power supply for simple, straight-forward installation; while our hardwired option can be used for new construction and remodels where the preference may be to keep all wiring within the wall. T&S is also proud to offer an alternative power option with our Hydrogenerator, using hydroelectric power to eliminate the need for batteries or transformers. By using the energy it generates, and storing what it doesn't use for later, this turbine-powered option provides a maintenance-free energy source and an easier installation option. As you configure your sensor faucet, don't forget that while each faucet comes standard with a 2.2 gallons per minute aerator, T&S also offers a variety of outlet devices, including non-aerated, low-flow, and laminar flow. An assortment of thermostatic mixing valves also helps ensure that the temperature of the water is kept within a safe range. In the end, T&S offers the most complete line-up of sensor faucet configurations, options, and accessories on the market today. Our 8 base models give you the best possible foundation to start, so you can count on hassle-free selecting and ordering and a fast and easy installation. At T&S, our experts have engineered and designed a truly cutting-edge electronic sensor faucet with all of the best standard features built-in to ensure reliable performance for years to come. Perfect for any sink area, T&S Chekpoint sensor faucets come standard with a wide variety of features that make installation, use, and maintenance simple. Check out the available models, and start using water wisely today. This ADA Compliant T&S EC-3103-TMV ChekPoint electronic faucet features a deck mounted cast spout that is 4 7/8" long and 5 1/16" high, perfect for use at hand washing sinks, bar sinks, and lavatory sinks where hand-free operation is crucial. Its thermostatic mixing valve comes with integral check valves. For superior water flow, each unit includes a 2.2 gallons per minute vandal resistant aerator. This chrome plated brass T&S EC-3103-TMV electronic faucet comes complete with a 3 5/8" x 4 3/16" x 2" deep water resistant control module box with internal flow control setting switches, that is AC or DC operated with (4) AA batteries. Holes punched on 4" centers are required for installation. This item meets the standards imposed by the Canadian Standards Association (CSA). This item meets the criteria established by the Americans with Disabilities Act (ADA), helping make your restaurant more accessible to people with disabilities. This item is designed for hands-free use, which reduces the risk of cross-contamination and prevents germs from spreading.